Reel Talk Online: Jeremy Renner Is Not Messing Around in the New Trailer for "The Bourne Legacy"
Jeremy Renner Is Not Messing Around in the New Trailer for "The Bourne Legacy"
If there was any question on whether Jeremy Renner has finally made it in Hollywood (despite two Oscar nominations), the trailer for The Bourne Legacy oughtta settle that with a resounding yes! Picking up where Matt Damon gracefully left off with the franchise, Renner eases into the role of Jason Bourne's alternate, CIA badass Aaron Cross. And, based on the trailer alone, he looks like he's already stirring up trouble in the homeland. Rachel Weitz and Edward Norton also join the franchise as newcomers, while Albert Finney, Joan Allen, David Strathairn and Scott Glenn are set to reprise their roles. Slick, effortless and dangerous, The Bourne Legacy seems like a perfect follow-up to Renner's role in in the mega action flick, Mission Impossible 4: Ghost Protocol. And with his role as Hawkeye in this year's Avengers, Renner's career seems unbeatable at the moment. The Bourne Legacy hits theaters August 3rd. Looks a lot better than expected, expections are high especially considering the cast. The trailer is better than I expected. I'm still not so sure about Bourne without Damon. Looks great. I'm excited. 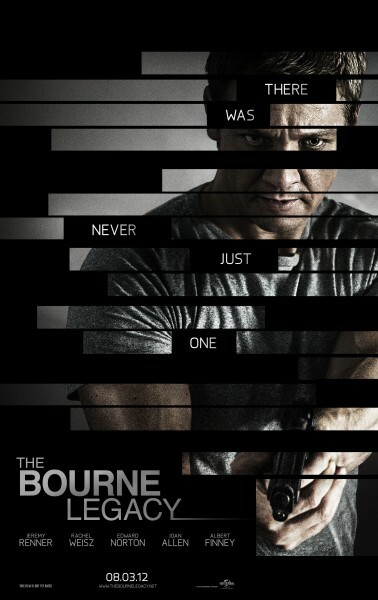 Glad they didn't just make a new Bourne, but are actually taking the franchise forward.